The U.S. Geological Survey (USGS) released a report on April 23, 2015 outlining evidence of “sharply increased” seismic activity due to human activity – “fracking” to be precise. A slang term for hydraulic fracturing. Fracking refers to the procedure of creating fractures in rocks and rock formations by injecting fluid into cracks to force them further open. The larger fissures allow more oil and gas to flow out of the formation and into the wellbore, from where it can be extracted. Slick assertions by fracking advocates, paint rosy pictures of harmless and inconsequential necessity. Common sense dictates otherwise. Last year Oklahoma had more magnitude 3 or greater earthquakes than California. Oklahoma, by far the banner state for “human” triggered seismic activity, went from an average of 1.5 shakes per year in 2009 to 2.5 a day in 2014. 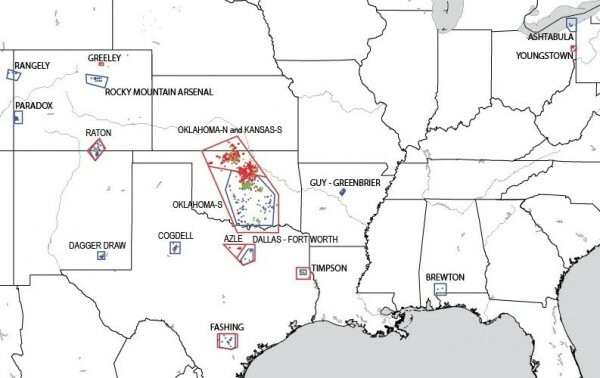 Texas, Kansas, New Mexico, Colorado and Ohio all reported increased seismic activity associated with industrial activity – translation, fracking. Fracking involves more than increased seismic activity – much more than an estimated 72 trillion gallons of water a year. Ponder 360 billion gallons of chemicals – formaldehyde, methanol, hydrochloric acid to name a few. Roughly half of this chemical sludge is recovered, taken by tanker or pumped into open pit pools to evaporate. Final “disposal” requires nothing more than a burial – groundwater, wells, agriculture of little consequence. An article posted last September on conservative website American Thinker made me laugh. The headline – “The Science Is Settled:Fracking Is Safe” illustrates the sorry state of right wing wisdom. The first paragraph, managed in a few short sentences to take a jab at climate change, declare fracking safe, followed by “end of discussion”. Citing the National Science Foundation, Duke University and “others”, the article stated extensive research examined 130 wells, concluding that only a “subset of cases” – 7 wells in Pennsylvania and 1 in Texas (faulty construction or cement) polluted groundwater. There are over 500,000 wells in America – using the ratio of 7/130, that’s over 26,000 environmental disasters. The rest of the article just made me mad – linked below if you can stomach nonsense about how over 1 million frackings resulted in an infinitesimal 7 screw ups – they “examined” 130 wells, holy crap. If the world was perfect, each and every one of these nincompoops would be forced to live in a community beside a fracking site.